My first true sour attempt (my previous 100% Brett is not really a sour since as a primary yeast it produces less acids). After Lacto kicks in I will add Brett C. then A-07. This is backwards to what is typically done but Wyeast research suggests this since Lacto has a hard time competing with Sach and Brett and Brett has a longer lag time than Sach. This should allow the Lacto to impart more sour acids and still leave plenty of sugars for the Sach and Brett. I have also read that by starting with the Lacto and Brett I can expect a much faster ferment than is typical of sours. I confirmed this at least with the 100% Brett beers I have made. The taste profile is much different however than say pitching Brett in the secondary to munch on the table scraps left from Sach. Pic is of 100% Lacto fermentation. It took 2 sleeps to get here. Looking good. I ordered a few sour blends to give it a try. How long are you planing on aging it? How long are you planing on aging it? I really have no idea. I'll play it by ear and SG and taste. Based on my experience reversing the order of "souring" bugs, and adding them individually instead of in a blend, I can get much faster fermentation than traditional sours. I will go Lacto then Brett then Sacch. So I'll give the lacto 3 - 4 days (depending on airlock activity), then Brett will need about 1 month and then German Ale yeast will have 1 - 2 weeks, so I'm looking at apx 2 month before I can even consider to start sampling for results. With any luck, I can get some results in 2 - 3 months. But this is much better than 6 months to 3 years! Keep in mind, doing it this way will give the beer very different flavours, since the brett and lacto are consuming completely different organisms and metabolites. If you read any stuff from Chad Yakobson of Crooked Stave Brewery you will see how this newer approach to "wild" beers is opening up a whole new style of wild beer. Bubbles slowed so I checked gravity (dropped from 1.050 to 1.031) and added Brett. C. I'm a little surprised the Lacto did this much, but I do have heat belts on the carboys and Lacto prefers warmer temps. Smell was acidic (go figure). Taste was slightly acidic and clean but still too much sugar to get full effect of acid. My plan is to add Saccharomyces at about 1.020 and hope to see it drop below 1.010. I think the pure lacto culture from Wyeast doesn't produce any alcohol, so you're going to have a very sour low ABV beer if you wait until 1.020 (assuming you hit 1.000, you'd only have ~2.5%). Also I suspect the acidity of the wort by the time you reach that level is going to be inhibitive to the sacc. - so might force it to misbehave also. 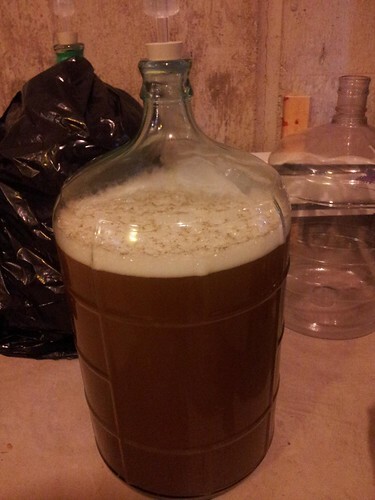 Yeah, I added the Brett at 1.031, but you are absolutely correct, it will be a low ABV beer. I am shooting for something akin to a Berliner Weisse, sour, clean and low ABV. My goal is to have a refreshing clean and tart session beer for summer months. That said, I was surprised it moved almost 20 points. Next time I would like to try and hit between 1.035 and 1.040. We'll see... it may turn out just fine. I'd love to try some at any rate, for a reference if nothing else. That, my friend, can be arranged! This is a really sweet experiment! I just finished reading wild brews and I thought that souring using this method was really interesting and it’s something that I’d like to do eventually. Are you going to use pediococcus? Or will you add later? Never knew about the crooked stave blog, nice info in there, thanks for sharing! Also do you know what your ibu’s was? I’m asking because I will use the same strain of lacto in a couple of brews soon and would like to know how much ibu it can handle. Seems like yours is doing quite well! lacto doesn't much like higher IBUs - I read (somewhere; I forget) that about 10 is common. True - According to sources (including Wild Brews), 7 - 25 is common. Liefmans Goudenband go as high as 33 I've read. This was almost a 14 gallon batch. BeerSmith calculates my IBU's at 9.6. The AA of my hops were 4% and 3.3% respectively. According to BeerSmith style ranges Berliner Weisse go from 3 - 8 and Gueuze 0 - 10. This is what really got me thinking of this approach. Well, I have hit 1.020 and I'm going to pitch the Sacch. tonight. Can't really put my finger on the taste... I can detect a slight acidity, but it's not sour or tart at all, still too much sweet sugar I guess. There is a little earthy mustiness I can barely detect. Maybe the sourness will come through after it attenuates more? Still very cloudy.